Math Dictionary-J deals with words starting with the letter J. In this page, we are going discuss about some words which start with the letter "j" and how they are meant in math. Some times, we would be much familiar with some words. But we would not be having more details about those words. The details which we do not know about those words may sometimes play a vital role in the subject math. Without knowing the details of those words, we would have difficulties to understand some concepts. So it is very important for us to know more details about some words which play vital role in understanding the concepts. If we take the word “joint variation”, we know the meaning for “variation”. When we see the word “joint variation”, its meaning would be little bit lengthy in math. The chance that two or more events occur together. 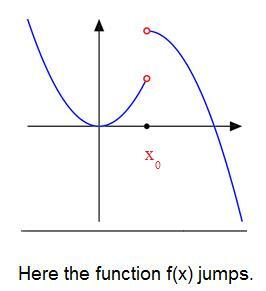 If the left and right hand limits exist, but disagree then the graph jump at x=a. More math dictionary-j are as follows. j: 'j' is the unit vector in vector study. In vector calculus Jacobian matrix is of all first order derivatives of a vector or scalar valued function with respect to another vector. Joint variation is the same as direct variation with two or more quantities. That is if a quantity varies jointly as two or more other quantities, the ratio of the first quantity to the product of other quantities is a constant. That is x/yz =k. We will update regularly the page math dictionary-j. We welcome your valuable suggestions. Please use the following box to express your suggestions.